People with ‘#justice’, ‘#humanrights’ and ‘#TeamHamas’ in their Twitter bios are furious right now. It’s not because of the Israeli doctors who in January saved the life of 12-year-old Palestinian girl Aya Almasal after her heart stopped en route from Gaza to Haifa for (free) treatment for a cardiovascular condition. Nor is it Israel’s new initiative of helping Gazan farmers export their tomatoes to Saudi Arabia and Jordan. You might think it’s the recent breakthrough on Crohn’s disease at the Weizmann Institute in Rehovot but you’d be wrong. No, the anti-Israel mob is beside itself after one of its own stood up and told the truth. Actually, Norman Finkelstein didn’t stand up. He sat down for a 30-minute interview with a student activist from the Boycott, Divestment, and Sanctions movement, the campaign to isolate Israel internationally by boycotting Israeli goods, denying employment to Israeli academics, and encouraging others to do the same. Finkelstein, a political scientist and author by profession, was – at least until this video appeared on YouTube – the pre-eminent anti-Zionist academic. 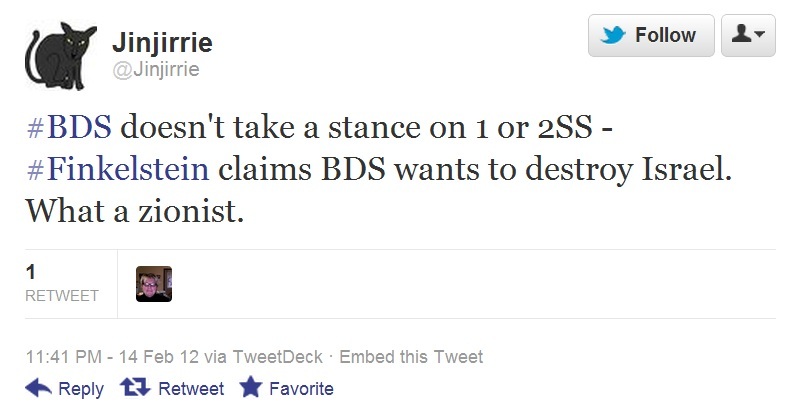 It would be no exaggeration to call him the dean of anti-Israel studies. His style is less that of a pipe-puffing professor and more akin to a pugilist. He is the author of The Holocaust Industry (thesis: the ‘Jewish establishment’ exploits guilt over the Holocaust for financial gain and to promote Israel’s interests) and Beyond Chutzpah (Israel and its partisans consistently level the charge of antisemitism against Israel’s critics to silence them) and, in addition to lecturing in politics in various universities, travels the world giving speeches denouncing Israel in the most belligerent language he can muster. Which is why this interview, filmed at Imperial College London on February 9th 2012, is astonishing. 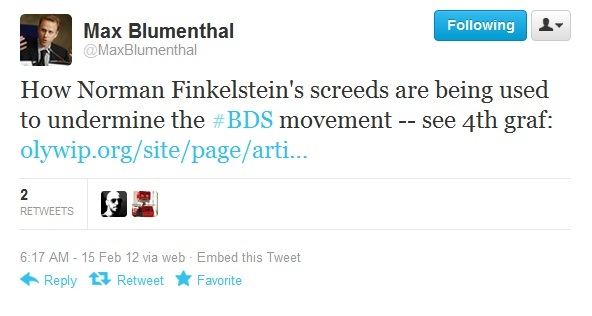 Finkelstein calls out the man behind the curtain in the anti-Israel movement. In an exasperated tone, he denounces BDS as a ‘cult’ that takes its orders from ‘the gurus in Ramallah’ and enjoins it to stop trying to fool people and admit it ‘wants to destroy Israel’. He accuses pro-Palestinian campaigners of ‘hypocrisy’ for seeking to use international law against Israel but refusing to recognise Israel’s right to exist within what he calls the internationally recognised June 1967 borders. Growing angrier, he compares the BDS movement to Maoism, noting that he was a Maoist in his youth but as a 58-year-old has no interest in being part of another ‘Maoist cult’. Finkelstein, while never rejecting his critique of Israel’s culpability in the dispossession of the Palestinians, debunks the extreme thinking that has come to dominate what calls itself the ‘pro-Palestinian movement’ but what increasingly resembles a campaign to delegitimise and destroy the State of Israel – and the Palestinians can take a number. That Finkelstein until now has been the high priest of this cult only makes his apostasy all the more shocking. 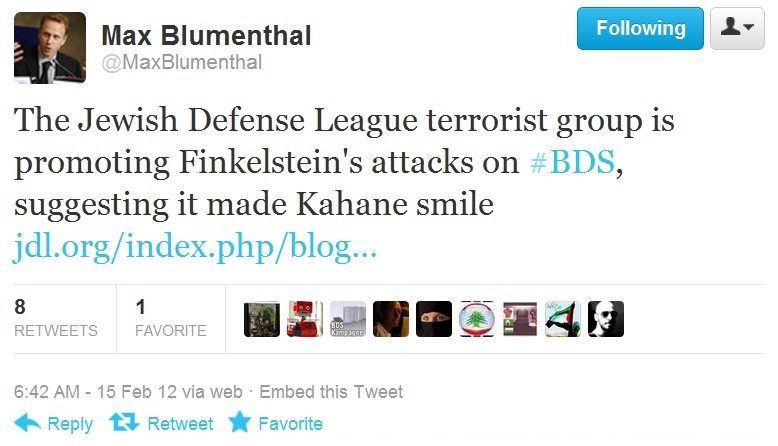 Finkelstein’s analysis is not rebutted and instead he is drenched in abuse. He is called a ‘Zionist’ – the worst accusation one can level in the pro-Palestinian lexicon. He promotes ‘zionist holocaust propaganda’ and is in turn promoted by ‘terrorists’. 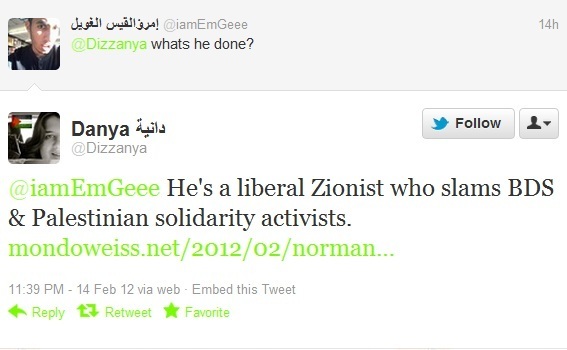 And in case ‘Zionist’ is too subtle, it’s helpfully explained that Finkelstein is a ‘sectarian’ Jew. 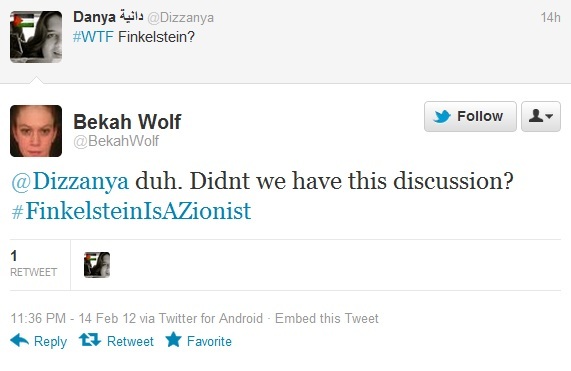 It’s educational to contrast what Finkelstein said with the belligerence of the language used in these tweets. He didn’t call for the annexation of Judea and Samaria. He didn’t pull on a ‘Rak ha Likud yachol’ t-shirt. He didn’t even treat the interviewer to a rousing chorus of ‘Shtei gadot la Yarden – zo shelanu, zo gam ken’. He merely said: Israel has a right to exist within its UN-recognised borders as a matter of international law and pro-Palestinian campaigners do their cause no justice when they champion the rights of Palestinians while seeking to deny the rights of Israelis. This includes, he says, the dishonest promotion of a Palestinian ‘right of return’ which would overnight tip Israel from Jewish-majority to Arab-majority status. Activists are ‘fooling no one’, according to Finkelstein, because everyone knows that changing the demographics of Israel ends its existence as a Jewish state or a national homeland of the Jewish people. A two-state solution, with Israel returned to its pre-1967 boundaries and a Palestinian state on the West Bank and Gaza, is the solution. It is not perfect or ideal but it is a peace everyone can live with. Group think. Rationalising away unhelpful facts. Orwellian inversions of language, history, and truth. 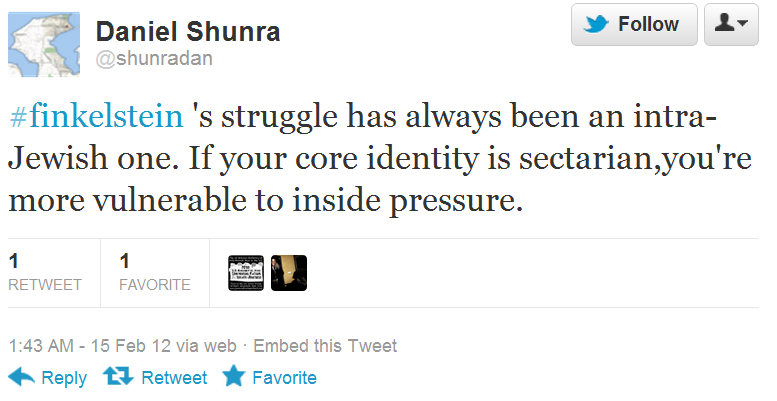 Worshipping gurus. 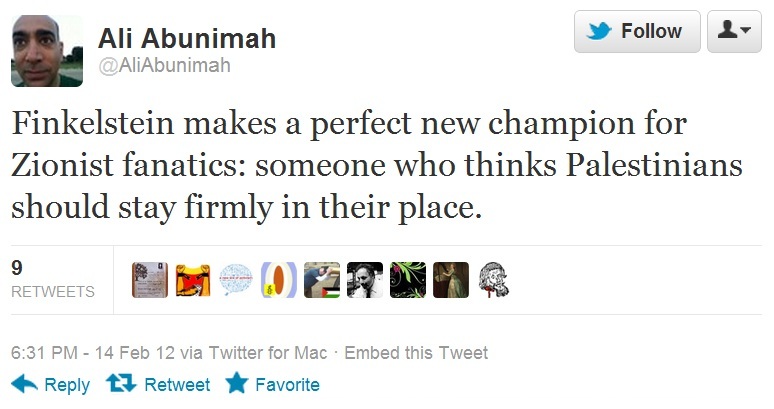 Demonising your opponents. Denouncing traitors from within who offer the mildest of criticisms. Marinating in an ever-simmering stew of violent rhetoric and hatred. The BDS mob displays all the tell-tale signifiers of cult-like behaviour. For evidence of this, look no further than their ridiculous leader Omar Barghouti, who experiences no cognitive dissonance in chairing the Palestinian Academic and Cultural Boycott of Israel Campaign while studying for his PhD at Tel Aviv University. Finkelstein isn’t ‘doing a Benny Morris’. He remains a left-wing critic of Israel and I see no reason to assume he will drop the outrageous and provocative language he uses to attack Israel and its supporters. He also fails to recognise that UNSCR 242 guaranteed Israel’s ‘right to live in peace within secure and recognized boundaries free from threats or acts of force’ but did not define those boundaries. The word ‘boundaries’ is significant. Any other resolution would talk about ‘borders’ but there were no borders in 1967 – only the armistice line from the 1948-49 war in which the Arab countries attacked and tried to destroy Israel (for the first time) the day after its creation. The Oslo Accords did not outline permanent status arrangements with regards to borders and in fact said these had to be decided via negotiations between Israel and the Palestinian leadership, negotiations which Israel has repeatedly offered to enter into with no preconditions only to be rebuffed by Ramallah or have the Palestinian leadership renege on draft peace agreements at the eleventh hour. Until Barack Obama, the US government, while pushing for a resolution to the conflict, has agreed that the pre-1967 borders are unworkable and has asserted that Israel is entitled to new ‘defensible borders’. So Finkelstein’s remarks are hardly ‘pro-Israel’; they are merely a plea from a lifelong radical that his fellow campaigners not sacrifice a just cause (peaceful coexistence) on the altar of deception and rejectionism. The BDS movement is a chutzpah industry, demanding justice for Palestinians while campaigning for discrimination against Israeli goods, services, and people. With exquisite hypocrisy, it organises boycotts of Israeli wine and mineral water and hummus using laptops and tablets and mobile devices designed and programmed by Israeli software engineers. The tone of BDS is not justice but hypocrisy and its symbol is not a Palestinian flag but a Judenstern. There is a progressive pro-Palestinianism out there somewhere but it continues to remain elusive, shouted down by the hardliners who are driven by a hatred that calls itself ‘justice’ and a tolerance of violence that masquerades as ‘peace’. Feature image © Takver by Creative Commons 2.0.